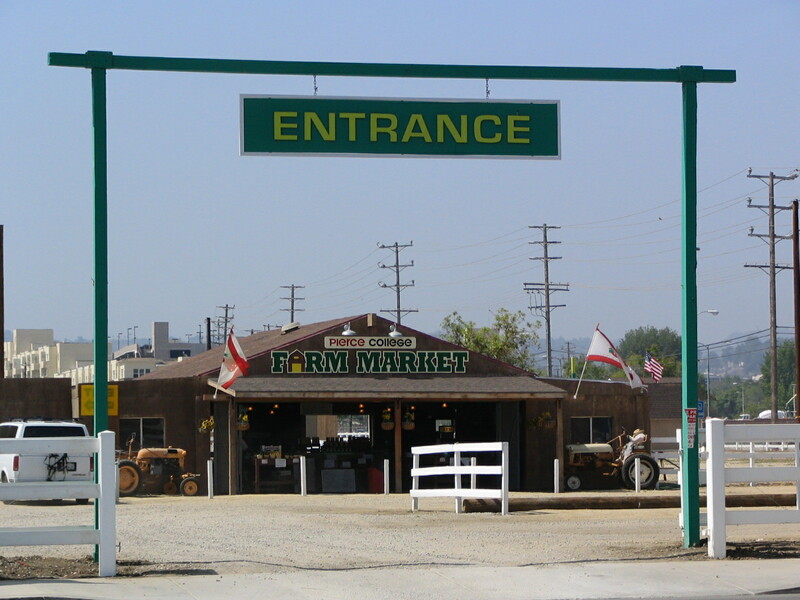 Tarzana was chicken ranches and berry farms until Edgar Rice Burroughs bought it in 1915 and called it Tarzana Ranch, after his famous pulp fiction ape-man. In 1927 the residents of Runnymede renamed the town, and it’s Tarzana to this day, though it’s a part of LA now. Jamie Foxx lives there, and Maya Rudolph, and Kevin Federline, and Eva Longoria. SF writer Larry Niven lives there, or used to. Tarzana is where Britney Spears got her hair cut off, and that’s about the most excitement the town has seen since John Carter took off for Barsoom. None of those people live down here on the flats, though, unless it’s the part south of the 101, where things are more luxurious. In fact, we only walked along the northern border of the neighborhood, which is the south side of Victory Boulevard. The north side is Reseda, which is even more boring than Tarzana. From here to the headwaters of the river, there will be no place where we can actually walk along it. Fences everywhere, no gaps to speak of, and what’s the point, anyway? 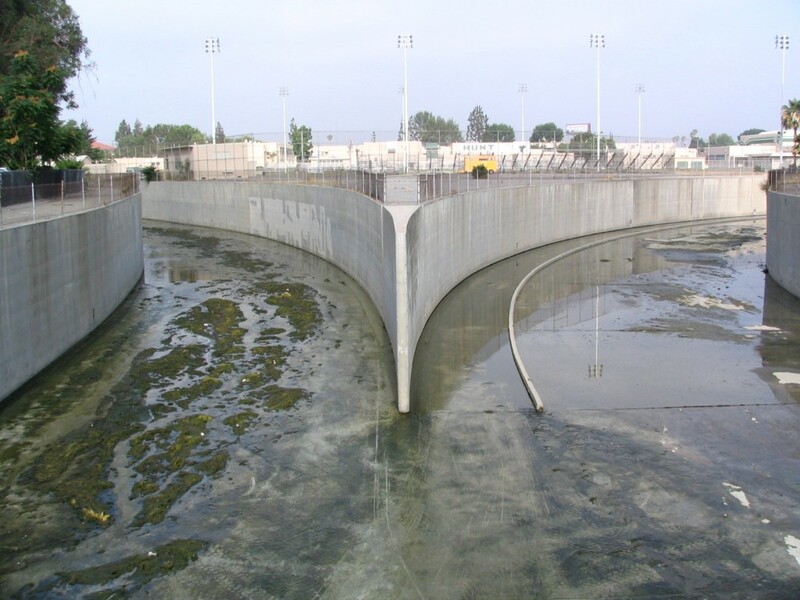 It’s just a concrete ditch. There’s really no point in describing today’s journey. It was so boring Lee was hard pressed to find things to photograph. 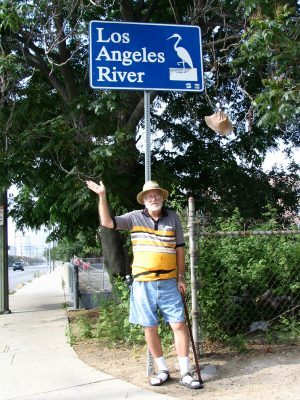 So this would be a good time to put in some things we’ve learned about the river though watching an hour-long video by Huell Howser about the history and functioning of this long concrete ditch, and especially the Sepulveda Dam. Huell talked to the people in charge of it, and as I suspected, the vast recreational area behind it was designed to flood from time to time. 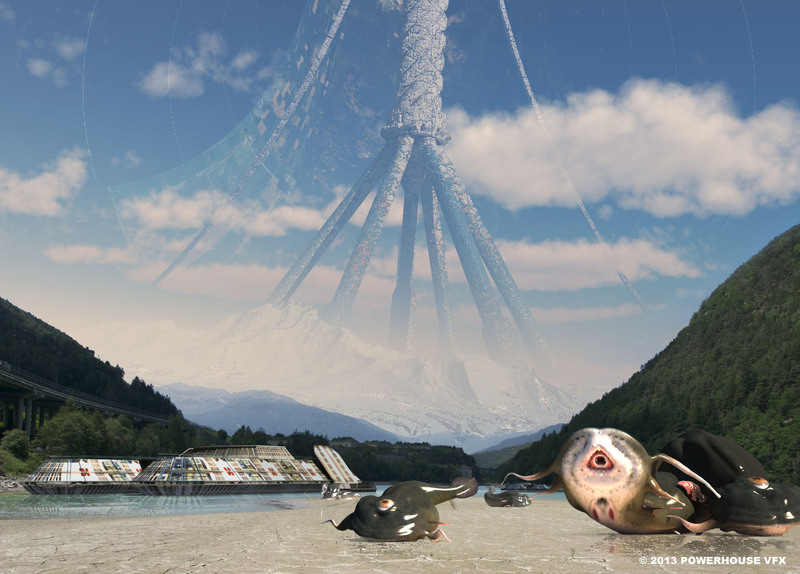 They expect a big one every 50 years or so, and at the time of the interview, they had just come off of a very big three-day storm when the reservoir had filled about halfway. The fields and golf courses were underwater. Burbank Boulevard was under three or four feet of water. Downstream, the water was washing over the bridges. They showed some footage, and it was an awesome sight. The little trickle we’d been following for so long was a raging torrent. The Corps of Engineers knew what they were doing when they channeled all the watercourses of the Valleys and the Los Angeles Basin in concrete … though I still think they could have made it prettier. But the Army doesn’t do pretty, I guess, and now there is a multi-billion-dollar proposal to turn the whole length of the river into a parkway. I think it’s a grand idea. The thing is, not only is the land behind the dam designed to flood … it is contemplated that in a 50 or 100-year flood, the land downstream will flood, too. There will be situations where it can’t be stopped. The dam can not be overtopped, it simply can’t be allowed to happen. If it did, the earth and rock fill would quickly erode and send a wall of water down the river, and lots of people would die. Hasn’t happened yet, but it will. It is a sure thing. Only question is when. This year we got three inches of rain. Total! We average 15 inches per year, which is not a lot, but think about it. That means that some years we’ll get 20, 30, 35 inches, and it all comes in three months. A huge amount of it can come in one week. And the dam operator will pick up the phone. Even in a 15 or 20-year flood things can get dicey. The dam operators control the water that’s coming in from upstream, but there are many tributaries downstream, and they will all be feeding water into the river in a big storm. The operator has to calculate how much water that will be to determine how much he can release at his end. He has to take into account how much is behind the dam, how much is on its way to the dam, how much more rain is likely to fall. All those are variables, as are pocket storms up in some of the canyons surrounding the Valley, and those are very hard to anticipate. It may not look so bad where you are, but if 5 inches is coming down in the San Gabriels, a lot of water is on its way to the sea. Man, that’s not a job I would want. When the Big Flood happens, one on the scale of the 1938 flood that inundated downtown and caused the river to be channeled in the first place, there are going to be a lot of very angry, very rich people who are going to want to know why their mansions were flooded, instead of the hovels downstream in Compton and Vernon and Bell Gardens. 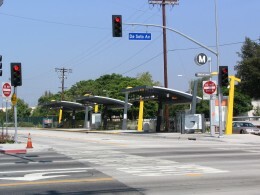 Winnetka to Canoga Park. How hard could it be? We set off early in the morning because the afternoons are getting hot, particularly out here in the Valley. My new fanny pack was busted, but I fixed it for now. Crossed the river and walked up half a block to see the last tributary, Aliso Creek Wash. They’re widening the bridges over the river, making an extra lane. Streets are already wide out here in the checkerboard Valley, but not wide enough, apparently. There’s a wide, main street every mile out here, with a semi-wide street every half-mile. I wonder if these roads were here back when the Valley was full of oranges, or if whatever thief stole it all in 1915 just drew lines on a map with a ruler? Lee snapped away at the mostly dull and uninspired homes and apartment buildings along Vanowen Boulevard. She can always find something of interest. 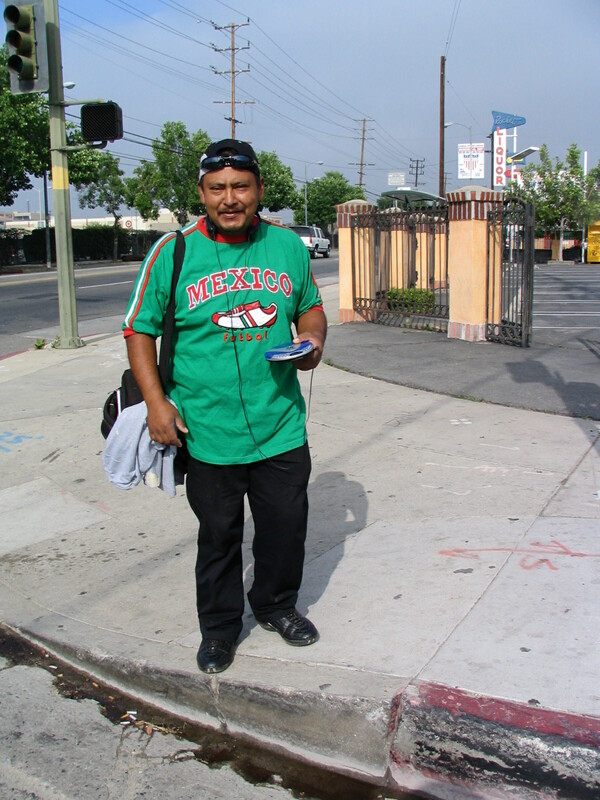 We began to notice clumps of Latino men standing around talking, watching the passing traffic. Lee talked to a guy who said it was as we had suspected: these were like the guys who hang around Home Depot in Hollywood, hoping somebody will pick them up for cheap day labor. I have the feeling that if we’d shouted “La Migra!” everybody would have vanished in thirty seconds. Then down three blocks of a residential area on Bassett Street, and there it was. The end. Well, not really … but it’s the end on the map, anyway. Two streams join at this point: Calabasas Creek from the south, and Bell Creek from the north and west. Technically, a river begins at the most distant point from its mouth. 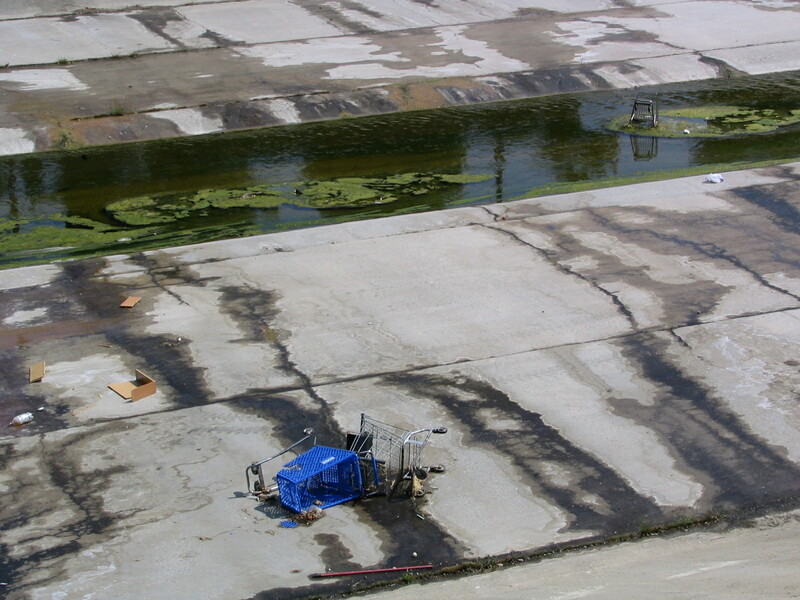 Therefore, the headwaters of either Calabasas or Bell Creek is the true end of the Los Angeles River. Well … Canoga Park isn’t Khartoum—though it is full of brown people—and Lee isn’t Speke (thank God!) and I’m not Richard Burton. And even cartographers make exceptions. Technically, the headwaters of the Mississippi are in Brower’s Spring, Montana, not Lake Itasca, Minnesota. 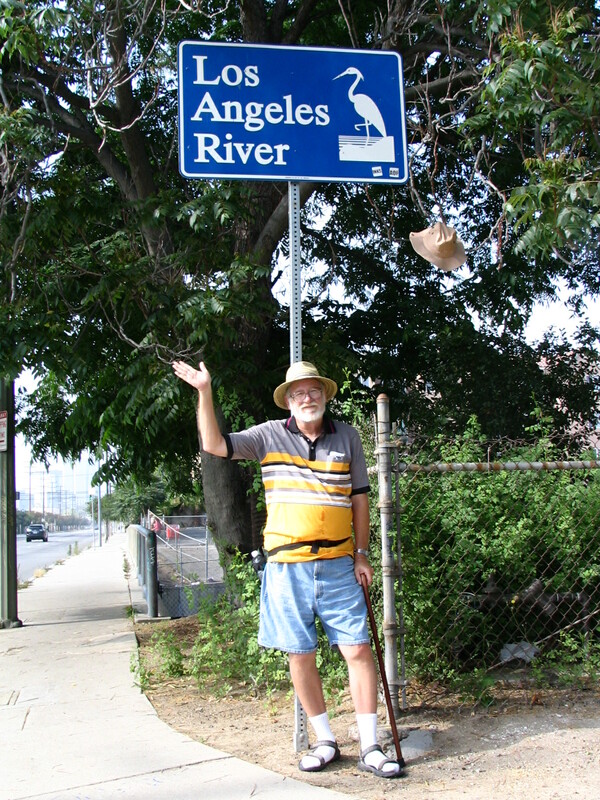 This, right here, is where the maps say the Los Angeles River begins, and this is where our trip upriver ends. I have a cunning plan, as Baldrick used to say on the Blackadder show. 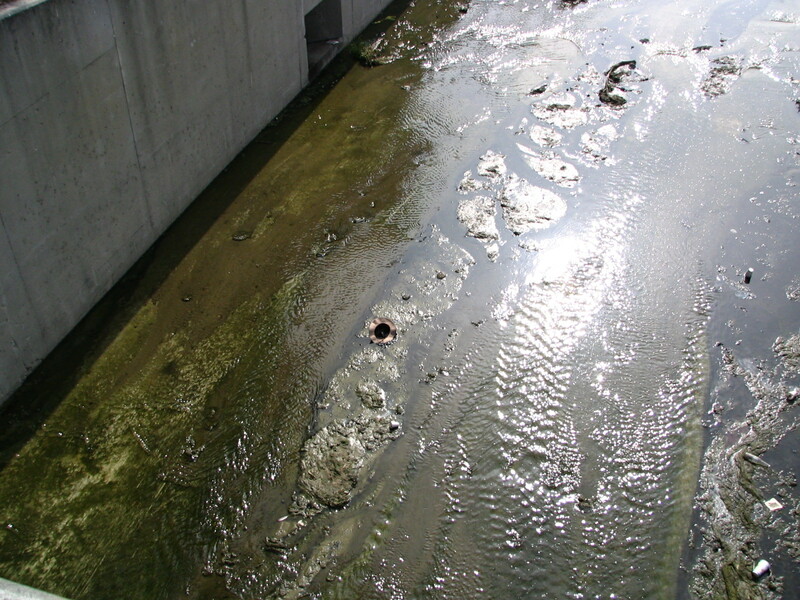 Most of the water in the river this time of the year is sewage. Treated sewage, but sewage all the same. Maybe we could flush the hat off the little island of muck, if we all work together. Here’s what I’d like to ask all of you, my faithful readers, to do. On June 21, at precisely twelve midnight, if you live in Calabasas, Hidden Hills, Woodland Hills, Canoga Park, Warner Center, or Chatsworth, all the communities upriver of where I threw my hat, I want you all to flush your toilets. Flush them several times. If you know anybody who lives in those places, ask them to flush, and ask them to ask their friends to flush. If we can get a “flush tree” going here, we might get tens of thousands of flushes. Hundreds of thousands of gallons of water coursing down into the river, lifting my hat off the little green island and down toward Long Beach. Lee and I will be in a restaurant in Canoga Park at the designated time, and will visit the facilities and add our little bit. Can we do this, my friends and faithful readers? If this succeeds, impeaching Bush and Cheney and ending the war in Iraq ought to be a piece of cake. Like I’ve said before, you never know what you’re going to get when you take a walk or open a box of chocolates. Maybe a cherry center, maybe toffee, maybe earwax or belly-button lint, like with Bertie Botts Every Flavor Beans in the Harry Potter books. 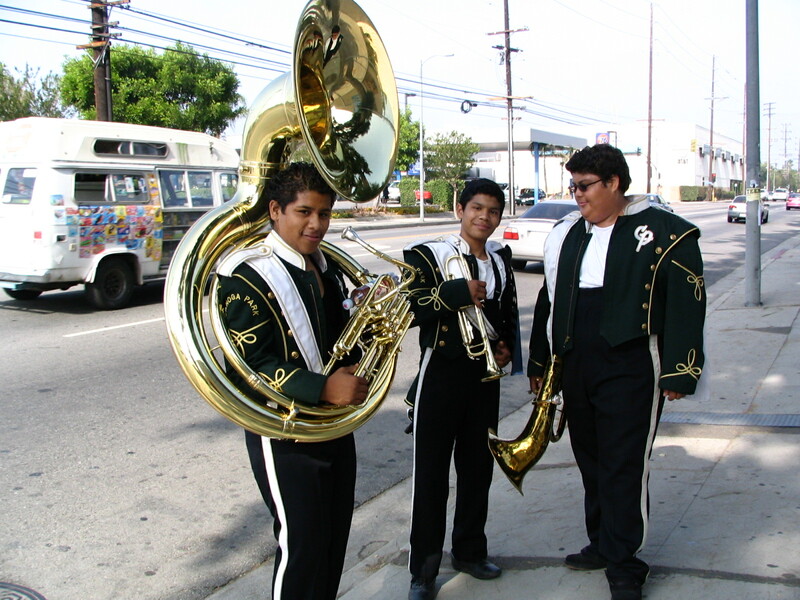 I was as tired as I usually am when we headed back to Vanowen, and longed to head east to the car, but here came a fellow in a band uniform, blowing hard on a Sousaphone. Not far away was a trumpet player, and a clarinetist, and a baritone horn, which I played during marching season at good old Nederland High School. Well, what are you gonna do? 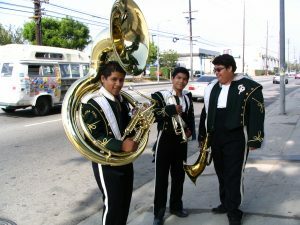 We started after them, and Lee caught up with them, and they said there was some sort of band festival at Warner Center. Wish we could have seen it, I’m a sucker for band music. By then we were almost to Topanga Canyon Boulevard, so we went south on that, alongside the Westfield Topanga Mall, not yet open for business, all of it quite distant behind acres of parking lot. A sign said they were re-modeling, making the place more family friendly. They are going to have a double-decker merry-go-round. I’ve never seen such a thing. Maybe we’ll go back when it’s done. 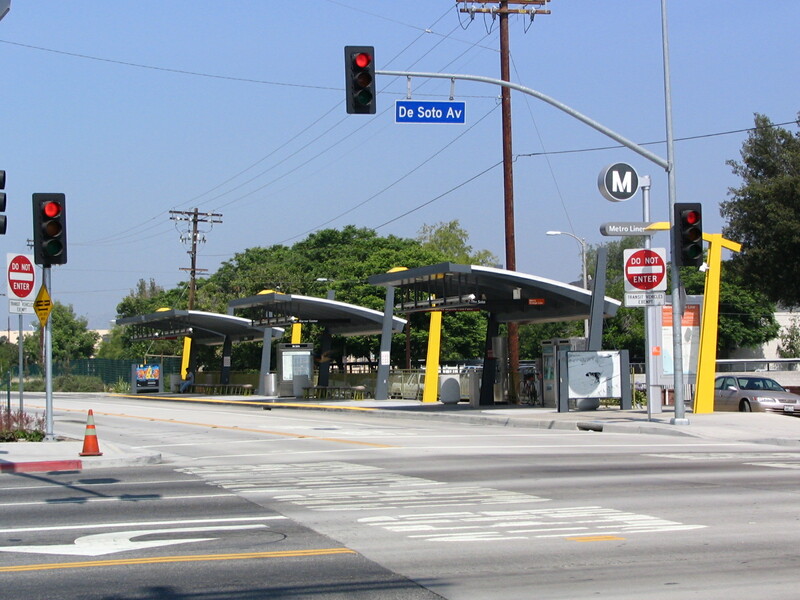 Hence to Victory Boulevard, and east, along the busway on a long, straight, well-traveled bike and pedestrian path. A female in-line skater made it look easy. We bid good morning to many cyclists. Walking is a lot friendlier than driving. To the south, Pierce College, which seems to have a large agricultural department. 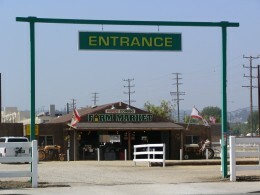 They were growing crops, there was what looked like a rodeo ring, and a farm market. Big buses swooshed along beside us, and I looked longingly at all the eastbound ones, but that would be cheating … which I’d gladly do, but Lee wouldn’t let me. We hoofed it all the way back to the car.